You Save: $3.40 (20%) Ships in 1 day. Soft Cover, 172 pages, 6 x 9. If you ride a bike, love good beer, and want to explore the beauty of the Rocky Mountain West -- long a favorite of mountain bikers and beer drinkers -- this book's for you. This five-state region's beautiful mountains, plains, and foothills, along with the proliferation of five-star brewpubs, makes it a biker's paradise. Visitor information for each city and town. Todd Mercer is a biking journalist, an avid mountain biker, beer enthusiast, and homebrewer. 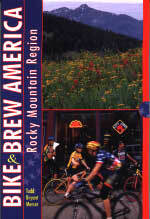 This is the first in his series of six regional Bike & Brew guides.